It was 2009. I’d been working endlessly on my novel, pretty sure I was wasting my time. Convinced I’d be more productive in the garden or in the kitchen, I stopped writing. Until I picked up a copy of Therese Walsh’s debut novel, The Last Will of Moira Leahy. I loved the story, but more importantly I loved the writing. Here was a writer I could identify with. Our styles were similar, our word choices almost the same. And our story choices—stories about women and their relationships—were parallel. When I finished reading her book I was excited. If Therese could do it, so could I. Well, Therese has done it again. Her fans have been “patiently” waiting for her next book and this year she delivered. Its working title Therese jokes, The Book That Tried to Kill Me, was published this year on my birthday. 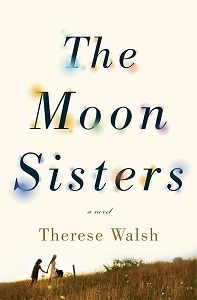 Therese Walsh’s second novel, The Moon Sisters, was published in hard cover on March 4th, 2014 by Crown (Random House). Her debut, The Last Will of Moira Leahy, was named one of January Magazine’s Best Books of 2009, was nominated for a RITA award for Best First Book, and was a TARGET Breakout Book. Therese is the co-founder of Writer Unboxed, a site that’s visited daily by thousands of writers interested in the craft and business of fiction. She has a master’s degree in psychology. Aside from writing, Therese’s favorite things include music, art, crab legs, Whose Line is it Anyway?, dark chocolate, photography, unique movies and novels, people watching, strong Irish tea, and spending time with her husband, two kids and their Jack Russell. I started writing plays as a child, but it wasn’t until I had a child that I became intrigued with the idea of writing fiction. It began with writing children’s picture book text and eventually evolved into adult fiction. My first adult fiction manuscript became my debut novel, The Last Will of Moira Leahy. I should have a writing routine, I’m sure, but I tend instead to write when the characters are very present in my mind and I have to write. The trick for me, to stay in that perfect zone, is to keep writing. It’s a little like water skiing, I suppose: Getting upright is the trick. Staying upright is less hard, and makes the whole thing fun. As many as it takes! Probably three complete reworks, but with many reworkings of scenes and chapters throughout the story. The best thing that happened with regard to my writing career was finding my agent, Elisabeth Weed. She is a wonderful advocate, and enthusiastic about my stories and my future. The worst thing was probably feeling the pressure of a two-book deal. Writing The Moon Sisters was often difficult for me because I was nervous about the deal, but ultimately I’m incredibly happy with the book. I love it when I write something and feel that perfect balance that I’m looking for in storytelling, depth of meaning, and in the cadence of the sentence. Those moments make me so glad to be a writer. I dislike the need to be so visible as a writer in this era of social media. I like to read books that are unique, that have a great voice, and that really make me think more deeply about my own life. I do read while writing. Not all of the time, but yes. I have fewer favorite authors than favorite books, but I will say that I recently finished Brunonia Barry’s The Map of True Places. Between that book and her debut, The Lace Reader, I know I’ve definitely found a favorite author. The best advice I received was to try to keep separate the craft of writing from the business end of things. It’s something I find difficult to do, but it’s important to work at that split. Like every writer out there, I’ve received advice I didn’t think was right for my novel-in-progress. But it’s hard to say that any advice is bad advice; it’s just advice you decide not to take. I think it really taps into the importance of doing a gut check for everything that you do as a writer. Every bit of advice I receive has to go through my personal filter. If it doesn’t make it through, it wasn’t the advice for me. I don’t try to emulate anyone, but reading The Second Coming of Lucy Hatch by Marsha Moyer influenced the way I approach first pages. Marsha chose to begin that book with the following line: “I was thirty-three years old when my husband walked out into the field one morning and never came back and I went in one quick leap from wife to widow.” I loved that line. It made me feel for the protagonist right away. I try to do the same—look for ways to help the reader feel, right off the bat. Empathy is connection. It is my favorite hook. I knock on wood, literally, every time I say something that might be predicting a good thing for myself or my books. I don’t know. I do have a master’s degree in psychology, so perhaps I would’ve found my way into an occupation that would have been a help to others. I have two story ideas vying for my attention. I’m playing hard to get; I’ve given a little to both but not enough to commit. Let them woo me. I would like to take what I know now and give it to myself back in 2008, right after my debut sold in a two-book deal. The Therese Walsh back didn’t know what was going to happen, and felt unsettled. While I wouldn’t want to necessarily give her a crystal ball, I’d love to give her some words of encouragement and tell her some stories about the publishing industry—what’s normal and what to expect. My former lack of knowledge is part of the reason I like to help pull back the curtain for other writers, and why we spent the month of February focusing on Inside Publishing topics at Writer Unboxed. I once gobbled at a turkey so authentically that it gobbled back at me. After their mother’s probable suicide, sisters Olivia and Jazz attempt to move on with their lives. Pragmatic Jazz takes a job in the same funeral home that handled her mother’s body, while spirited, strong-willed Olivia—who can see sounds and taste words—wants to travel to the remote setting of their mother’s unfinished novel to see the will-o-the-wisp lights that she’d written about. A reluctant Jazz agrees to go with Olivia, and as they journey toward the wisps, their acceptance of their mother’s death becomes as important as their journey to understand each other and themselves. To celebrate her new novel, Therese is holding “A Taste of Hope Contest.” Describe what hope takes like and you just might win some cool prices. You can enter the contest here. This entry was posted in Guest author and tagged a writer's life, Bonnie Dodge, Brunonia Barry, Marsha Moyer, Moira Leahy, Moon Sisters, Therese Walsh.